After so many moves from country to country, my adventurous heart sometimes gets a little lost. Let’s face it – while I’d love to be traveling to new places each month – most of my days are like any other day. 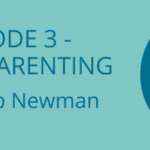 My husband and I get the kids off to school, we do laundry, we go to work, we help with homework, do dinner, bedtime, rinse, repeat. And on the weekends maybe we see a new part of town or go out to dinner. But, every once in a while, I see the way in which my true spirit – one that needs newness, adventure and exploration – comes shining through. And I’m reminded that just because most of our days are like any other day, doesn’t mean that my adventurous side can’t be fulfilled. I just have to embrace it when it pops up in unlikely places. 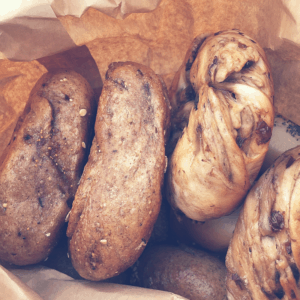 Like last Friday – on an unanticipated adventure to find Tokyo’s best bagels. We had heard about this bagel place before, but had never tried to find it because it’s pretty far from our house. My husband had the day off and we were at Tokyo Station buying shinkansen tickets for an upcoming trip. This put us closer to the bagel shop than we typically go. It was a completely last minute decision, but we decided it was worth trying to find it. As we came up the escalator, I noticed I felt this exciting sense of anticipation. 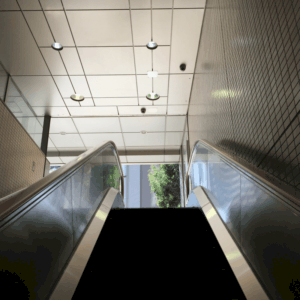 I love the feeling of getting to the top of a train station escalator in a part of Tokyo I’ve never been to before. I’m moved by the sudden swish of air coming from above and the sense that I don’t know what we’ll find once we reach the top. It holds the same place in my heart as landing in a new country. We had our phones, so this is completely unlike the old days when we’d tear the map page out of our Lonely Planet and meanderingly make our way to our destination. But – we still found ourselves twisting and turning around office buildings and corners. Where was this place!? That sense of deciphering a puzzle is one of my favorite parts of international adventure. When we were younger (and without kids) I loved most of all the days when we just started walking in the direction of the site we wanted to see and figured we’d end up there eventually. It’s a strange mix of confidence that you’ll succeed and acceptance of uncertainty. I love the balance between those two sensations. And then, standing in the middle of the road, thinking the place must have closed down, we just had this gut feeling. There were some women dressed in matching striped shirts and white pants outside a small shop. They were laughing and had aprons on. The door to the shop was open. 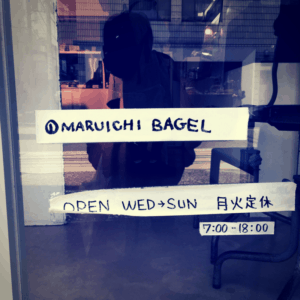 There was no sign and we couldn’t see through the front window because of the angle of the sun, but something told us this was the place – set back from the road, nothing to designate it Tokyo’s best bagels. We tentatively walked closer (something we’ve done for so many meals in so many countries). And there it was, written on a piece of 2-inch, white athletic tape stuck to the front window – Maruichi Bagels. We were there! Our smiles could not be contained – we breathed in the fabulous smell, our eyes popping at rows and rows of crunchy, round crusts and containers of toppings and salads, a pile of paper bags just waiting to receive our selections. This is the heart of adventure! Arriving! Having made it! Then we made our purchases. And doesn’t this always happen when you’re traveling – wanting to take it all with you? Don’t leave anything behind! You never know when you’ll be back. What’s a few extra yen? It’s worth it! Stock up! Don’t let the adventure die too soon. Not even for one moment did we consider we were buying too many. A dozen bagels later, we were on our way. 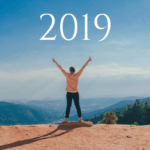 But – it gets better! As we were leaving one of the employees outside said that on the third floor they were doing a one-day chocolate mousse taste-test. How strange, we thought. Chocolate mousse, why? We made our way up a somewhat rickety, nondescript staircase (because on international adventures you ALWAYS make your way up the somewhat-rickety, nondescript staircase) and opened the door. 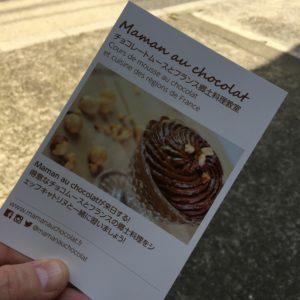 There, in a big room was an older French couple – the woman, a dessert chef, and her husband had decided to try their hand at selling her chocolate mousse in Japan. Their son lives here. The wife spoke only French and what a wonderful nomad moment – the mix of languages and flavors and people trying new things! We sampled our mousse…and, sadly, in our excitement didn’t buy any! This is truly the heart of the international life – taking steps in directions you hadn’t anticipated, only to find things there you never expected to see. The overlap of language and curiosity, food and strange twists in the road – it’s what joins us to this life…even when we know most days just seem rather average. And how inspiring it all is! When you see new things. When you travel and open your eyes to adventure – even in a place that has started to feel like you’ve figured it all out – you become more creative. You begin to realize that you can choose to do something different, or better, or more fully than you’ve been doing it for a while. Or you can stop all together with the things that don’t work for you anymore. You realize there are so many options. 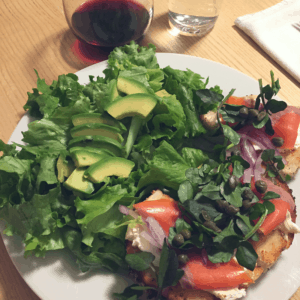 And so that night we had a beautiful, bagel-inspired feast! I tell people all the time that this life around the world is, most of the time, just normal life. And then I realize that that’s not really true. Our lives are lived from seeing adventure in the every day and I find that to be a truly unique gift of moving from place to place around the world. Even if we temporarily lose our sense of adventure – we find it again, just around the corner.